Scientists estimate that if measures are not taken to protect it, in 10 years’ time the shihuahuaco may go extinct. In 2018, around 4,000 cubic meters (141,000 cubic feet) of shihuahuaco timber was illegally extracted. The loss of the tree, one of the tallest in this part of the Amazon, would have a severe ripple effect on the species that live in and around it, including the increasingly rare harpy eagle, the biggest raptor in the jungle. 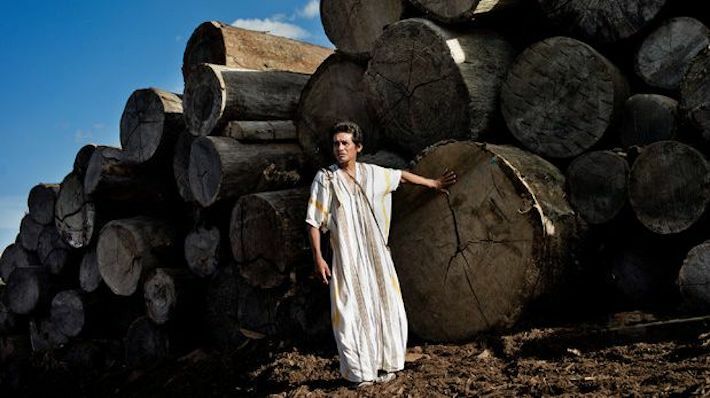 MADRE DE DIOS, Peru — On the shores of Las Piedras River, in the small port of Sabaluyoc in southeastern Peru’s Madre de Dios region, a group of loggers has just unloaded some timber. The sky is overcast with black clouds and a storm is about to be unleashed. They’ll have to wait until the rain has passed before departing along the earth and mud track that connects this area to the Interoceanic Highway, linking this part of the country with Brazil. One of the biggest threats to the Amazon is the illegal felling of trees that are more than 500 years old. And over the last few years, the shihuahuaco (Dipteryx sp.) has become one of the most threatened of these slow-growth trees. An imposing tree, it grows slowly over the course of 700 years to heights of 50 meters (164 feet) and a trunk diameter of 1 meter (3.3 feet). Some researchers say that if the logging pressure on this tree continues, the shihuahuaco could go extinct soon. That puts the shihuahuaco in the company of mahogany and cedar, among other trees pushed to the brink of extinction by human demand for timber. One of the biggest threats to the Amazon is the illegal felling of trees that are more than 500 years old. Image by Leslie Moreno. In 2001, mahogany and cedar, whose high-quality, durable wood was extracted in huge quantities by legal and illegal loggers, were included on the list of protected species by the Convention on International Trade in Endangered Species of Wild Fauna and Flora (CITES). Peru signed up to this agreement in 1975 and still remains a member. Changes in the monitoring and international trade of mahogany and cedar have prevented their extinction, although their numbers have been dramatically reduced. That’s led loggers to target other trees, including shihuahuaco, for which there are no laws or measures in place to protect them. Article 138 of Peru’s Rules of Forest Management states that the “at-risk” classification for wild flora should be updated every four years; however, there has been no update since 2006. “Today, mahogany is rare and it is now the shihuahuaco that is being threatened in the same way,” says Daniel Valle, a Peruvian expert in biological conservation. The tree occurs in the departments of Loreto, Ucayali and Madre de Dios. The latest report by the United Nations Food and Agriculture Organization (FAO) and the Peruvian Technological Institute of Production (Instituto Tecnológico de la Producción, ITP) show that these three departments are also home to more than 60 percent of businesses and 79 percent of turnover in the forestry and wood extraction sector. In 2015, the National Forestry and Wild Fauna Service, known by its Spanish acronym, Serfor, organized a working group of 99 specialists from across the country to establish ways of protecting the shihuahuaco and other trees. The group was overseen by the Environment Ministry and its aim was to review and update the list of threatened wild flora. The final proposal, published in September 2016, included 705 species, 61 of them in critical danger and 87 in danger. The shihuahuaco was on the list. Yine community: The indigenous communities that live in the Amazon are threatened by timber traffickers to ensure they do not report the raids. Image by Leslie Moreno. Despite the requests and the recommendations from the scientists, the categorization was never made official. So what happened? Rodolfo Vásquez, an investigator and scientific forestry coordinator for the completed study, has a theory: “The opinion of the timber companies is more important than that of the scientists. They put up opposition in the public consultation [before the project was approved]. And ultimately, Serfor undervalued the work that was done,” he says. At the end of 2016, the weekly publication Hildebrandt en Sus Trece published a report detailing observations in reaction to the document produced by the working group. This report was written by Elialdo Motta, the monitoring manager of Bozovich Timber Products, a subsidiary of one of the country’s most important timber consortiums, the Bozovich Group. The businessman maintained that there were no quantitative studies to support the inclusion of the shihuahuaco to the category of threatened species. Asked about the issue, Wilfredo Mendoza, a scientist and coordinator for the study, told the website Ojo-Publico.com (“Public Eye”) that this new category for the shihuahuaco would allow “business to be more controlled.” He said that during discussions of the working group, the categorization of shihuahuaco was the most contentious because it was one of the most traded. Faced with the insistent request from the group of scientists, Serfor responded with a letter, sent in January 2017. In the letter, it was suggested that various holes in the information had been detected during the categorization process, meaning Serfor was unable to support the classification of some species. The letter, signed by Walter Nalvarte, from the Administration of Sustainable Management for the Development of Wild Forest and Fauna, said the study had not carried out an analysis on the population of shihuahuaco, when this evaluation should have been carried out by Serfor. The group members said the study systemized and analyzed information from the last 20 years, comparing this to data from the Agriculture Ministry’s official forestry records. Serfor did not respond further, and the scientists’ study recommending the inclusion of shihuahuaco to the list of threatened species was left forgotten. Serfor maintains that the re-categorization of species in danger is still in the works. It is “processing the contributions from the scientific community and additional information together with the first results from the national inventories,” it said in a response to Ojo-Publico.com. However, the inventory corresponding to the regions in which the shihuahuaco is located — Loreto, Ucayali and Madre de Dios — amounts to just 9 percent of the total sample. In this context, an update of the new species being impacted by high demand in the international market seems to be some way off. In 2018 alone, Osinfor has identified nearly 4,000 cubic meters, or 141,000 cubic feet, of illegal shihuahuaco originating from the Amazon. Image by Leslie Moreno. In line with audits carried out from 2009 to 2017 by the Agency for the Supervision of Forest Resources and Wildlife, known as Osinfor, more than 2 million cubic meters (71 million cubic feet) of timber of illegal origin was traded. This volume is equivalent to 75,000 truckloads of timber. The most extracted species are the Peruvian pine (9 percent of the total), lupuna (8.8 percent), cumula (8.6 percent) and, in fourth place, shihuahuaco (5.5 percent). In 2017, Osinfor carried out supervision in these licensed areas, finding 23,000 cubic meters (812,000 cubic feet) of shihuahuaco. Ojo-Publico.com said as part of this investigation that the main destinations for the most traded species are the United States, followed by China, Mexico and the Dominican Republic. The timber arrives in these markets to be cut for furniture, parquet flooring or door frames. The illegal logging of these trees doesn’t just threaten the species, but also the animals that make their homes among them. In Las Piedras, for example, there remain few harpy eagles (Harpia harpyja), one of the largest raptors in the world, which makes its nests in the tallest trees — and in this part of the Amazon, that would be shihuahuaco trees. Visitors are now very lucky if they see any harpy eagles in the forest. The earth and mud track to the basin of Las Piedras is one of two routes with which indigenous communities in this part of the Amazon have come into contact. The isolation in which they and other communities live has allowed the violent extraction of timber, which has gone unpunished. In 2014, the body of indigenous leader Edwin Chota was found riddled with bullets on the outskirts of his territory, after he reported timber trafficking. The audit office only responded to his reports after his murder. On the other side of the river bank, the sound of sawing is audible. It’s said that they’re logging quinilla. This area is not authorized for extracting timber, but, as with other species, the timber will be sold using falsified documents to launder its illegal provenance. Recently, the Environmental Audit Office for Madre de Dios became aware of a report of illegal logging of shihuahuaco, cedar and lupuna in the region. The loggers were using electric saws made from a special material to fell the trees, taking advantage of a lack of supervision in the area to remove the timber. Neither the auditors nor Osinfor could do anything about it, and those responsible were never identified. According to Osinfor, Madre de Dios is the region with the greatest number of supervisors charged with auditing forestry concessions (2,026). It’s followed by Loreto (970) and Ucayali (595). However, it says these numbers are insufficient to check that the handling and use of the conceded resources follows the companies’ forestry management plans. A lot of the supervision entails journeys to remote parts of the forest that, in many cases, can only be reached on foot or by boat. In the basin of Las Piedras, there’s no cell signal or internet. The only state service that the indigenous people have access to is a solar energy system for which they have to pay. Between 2009 and 2017, environmental auditors and judges across the country investigated nearly 8,000 people for cases involving the illegal trafficking and extraction of timber. The departments with the greatest number of people under investigation were Madre de Dios, Lambayeque, San Martin and Ucayali. It’s a finding that ties with information obtained and analyzed by Ojo-Publico.com. The crimes that top the investigation’s ranking in this sector are against the forests or forest formations, followed by the illegal trafficking of forest timber. Back by the banks for Las Piedras, there’s the sound of a motorboat approaching. Just like many others during the trip, this one also carried timber, but it didn’t unload it in the small harbor, stopping several meters farther away instead, where nobody would see it. This story was reported by Mongabay’s Latin America (Latam) team and was first published here in Spanish at the Latam site on Sept. 30, 2018.